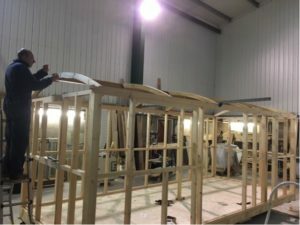 You can see more pictures of the project progress here. Up and running. Our first real guests stayed with us and said they loved the place. You can read their review here. 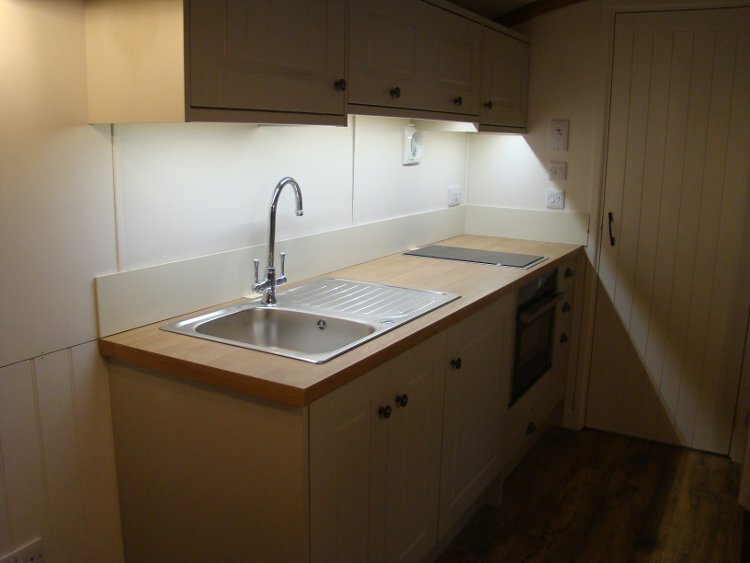 All interior and exterior works completed. There are pictures of the completed facility here. Our testers came and lived in the hut of several days. There were a few minor things which were all easily sorted. Overall they were really impressed. Our Hut was then loaded onto a low-loader for the careful journey to the site. 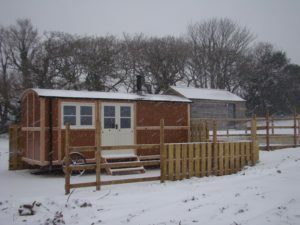 With the help of our friendly local farmer we installed the hut on site; just hours before the snow hit us. Were we relieved! We now need to finish everything off both on-site (like completing the patio and landscaping) and commissioning the hut itself. This is expected to take a few weeks. 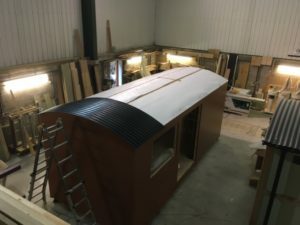 The hut is very close to being complete. The construction is complete and most of the equipment has been fitted including the bed, kitchen and en-suite. 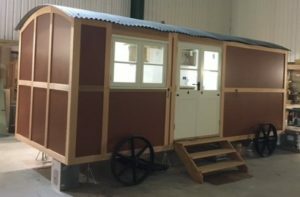 The only major pieces of equipment left to do are the TV and the log burning stove, which will be fitted once the hut is on site. On site preparations for delivery of the first hut are well under way. The utilities hut and kennels have been completed and the services (washer, dryer and freezer for dog food) installed. See pictures here. Work outside has been continuing, but at a planned slower pace due to the weather. A lot of work has been going on in the background, much of which remains unseen. Some of the main works are listed below, and we expect to have pictures of more visible progress in the next few weeks. 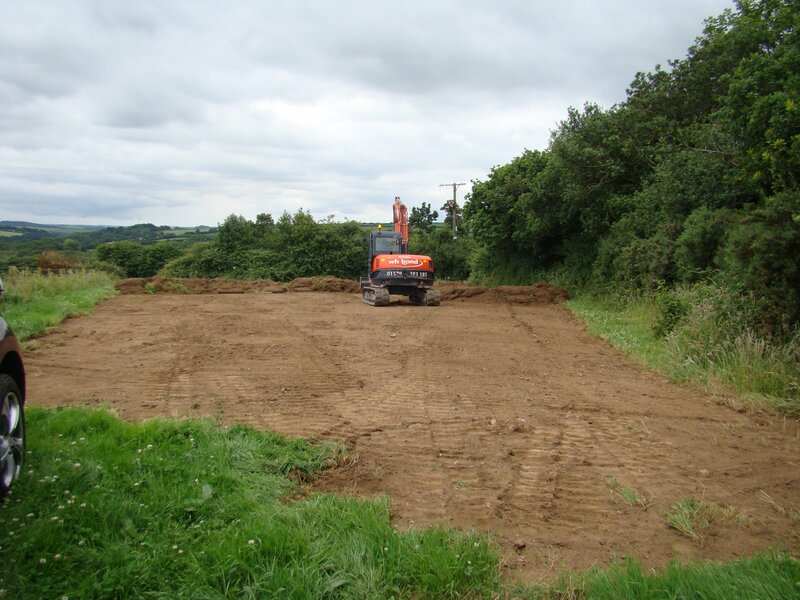 We also ordered the first hut and building of the hut has started. We had 2 main issues at Bed and Basket. The first was that we were getting so busy that some of our regular guests were finding it difficult to book. The second was that because the barns are in converted stone buildings they all have stairs in them which makes it difficult for people (and dogs) with limited mobility. 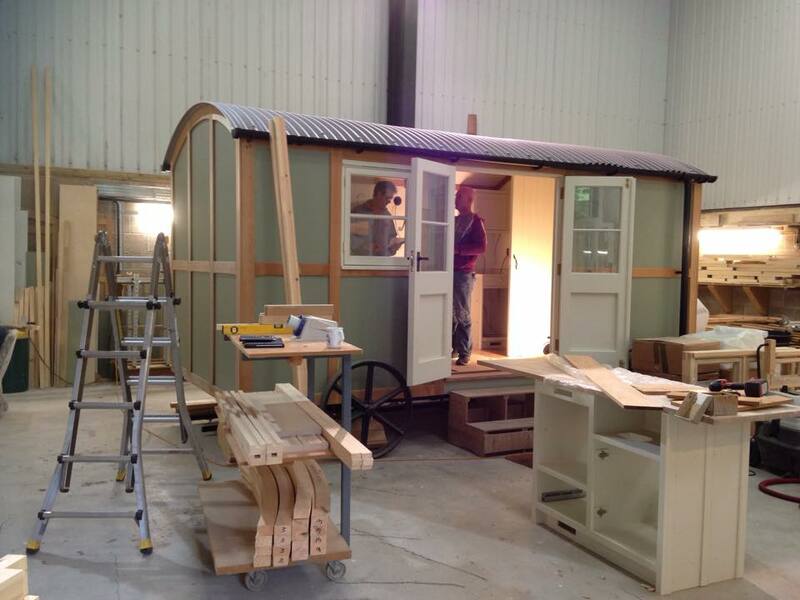 So we spent over a year researching the options of what we could do and settled on high-quality shepherd’s huts. 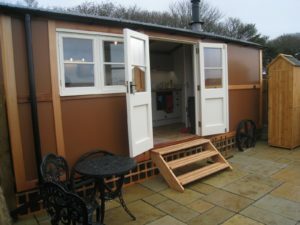 We reviewed and visited a number of builders of such huts and finally settled on one in Devon who not only made excellent huts, but was also willing to customise for our needs – particularly making them dog friendly. At the same time we were negotiating with the local farmer and agreed to buy part of a field that is adjacent to Bed and Basket. 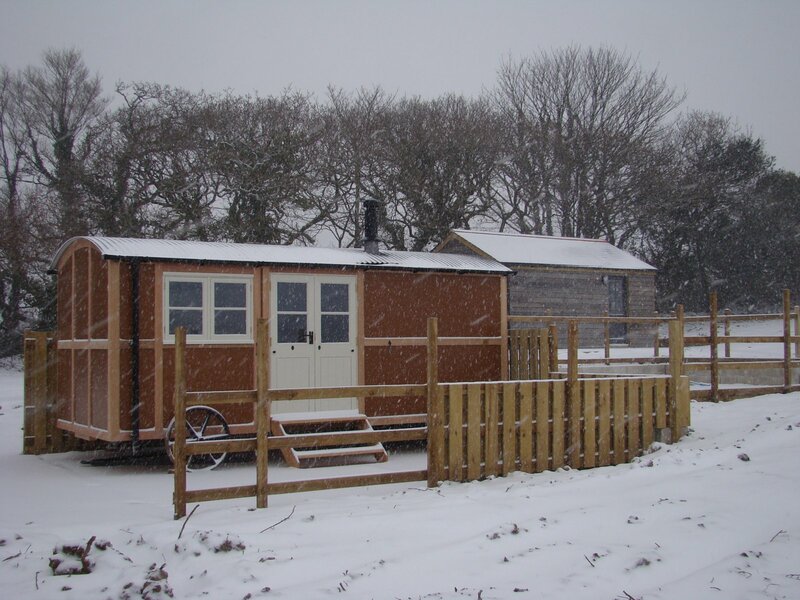 Whilst providing the best dog-friendly holidays we can, the concept of huts is different to stone barns, hence the new name. 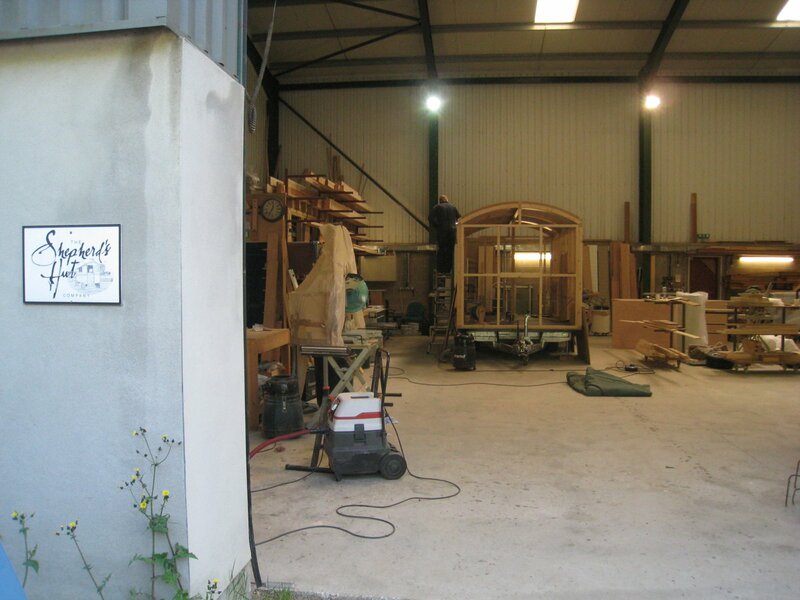 We applied for, and received, planning permission for the venture. We also planted a twin hedge line along the cattle fencing at the edge of the planned exercise field.